I got to work: SCRAP SHORT TERM TOURIST VISAS TO GHANA for jobs! On May 1 Workers’ Day, I started a FB Group and a Change.Org petition called SCRAP SHORT TERM TOURIST VISAS TO GHANA. Here’s the blog post! I chickened out sending the group link to the G.I.S., but they know…as I’ve heard from two independent sources that it has caused a stir to put it mildly. Well, I didn’t actually chicken out. I just held off thinking, “Hey, better let some content build up”…and did the ideas and stories ever come in…. Thursday, I attended the opening of PRECEVID (The Presbyterian Centre for Vocational Instructor’ Development) which has been established as a centre of excellence to address the human resource need in the hospitality industry. And that it is! State of the art facilities to train professional housekeepers, front office staff, cooks, waiters and waitresses for the hotels. Well, I had the pleasure to meet Andrew again. he was featured in the post affirming my belief that there is no political will to develop tourism. It came at the end of the series of posts presenting theories on why there is no political will. I haven’t posted any more theories since then although there are lots circulating in my mind. In the back of my mind was the one that civil society is mute here on the deteriorating state of tourism…I refer specifically to GHATOF that federation of Ghana tourist organizations. So instead of theorizing, I got to work and became a one man civil society hee hee. Service in the hospitality industry in Ghana is generally poor. This is because we lack the requisite skilled personnel to perform the roles to the approved standards. 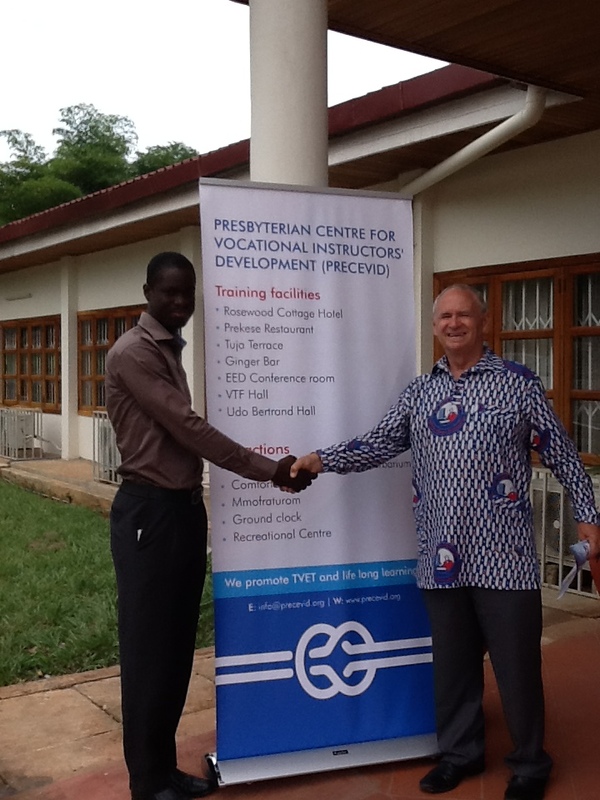 The Presbyterian Centre for Vocational Instructors’ Development (PRECEVID) has been set established as a centre of excellence to train trainers and instructors for Technical and Vocational Education and Training (TVET) institutions as well as service providers in the hospitality industry. The concept is to train the trainer from whom the learning experience starts with. Rosewood Cottage Hotel is the hospitality training facility for PRECEVID. Here’s Andrew and I at the opening, so very hopeful…if the tourists start coming…. and lastly….just to bring this post back to SCRAP SHORT TERM TOURIST VISAS TO GHANA..did you know that Kofi Annan returned to Ghana in 1974 after his masters to work in tourism development and promotion. He soon left Ghana and as they say the rest is history. Ghana’s loss was the world’s gain…a scenario so often played out today. Anyways, wouldn’t it be great if Kofi Annan returned to Ghana and picked up wherever he left off. I am sure he would join our scrappers group and sign the petition…we are an Intervention! hey Chris, you really are a firebrand! Ghana is lucky to have you..